Trailing Navy 17-3 with 8:20 left in the fourth quarter yesterday, Army gets the ball back after holding Navy to a three and out. Given the lack of offense generated by the Black Knights, this was probably their last chance to try and get their first touchdown against Navy since 2006 to tie the game. What happened next is probably the best reason for a network to NOT have sideline reporters, or to at least avoid meaningless throws down to them at a critical juncture of a game. It was at this point that CBS Sports decides to have Tracey Wolfson conduct a sideline interview with a Navy player from the 1980's. As the interview goes on, Army snaps the ball at their own 34 yard line and Kingsley Ehie (9 carries for net 28 yards on the day) takes the handoff, gets hit for a two yard loss, and fumbles the ball. Craig Schaefer (5 tackles, 20-yard fumble return, 1 pass breakup) of Navy recovers the ball and returns it to the Army 12. 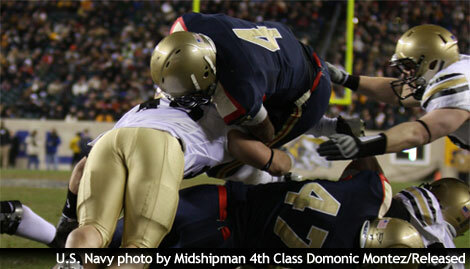 Four plays later, Navy QB Ricky Dobbs scores from the 1 yard line to make the score 17-3, sealing the victory. But what did viewers see? A split screen with Wolfson interviewing the former player in the lower left hand corner and the live action (with no audio) showing in a box diagonally top right of the interview box. So while the game changing play of the day was happening, viewers heard nothing from Verne Lundquist and Gary Danielson in the booth. Producer Craig Silver had backed himself into a corner because there was absolutely no graceful way to break out of the interview to get back to live action and the call of the game. Here is a link to the post-game recap, where you will see Navy QB, and player of the game, Ricky Dobbs (3-7, 61 yards, 1 TD, 1 INT; 33 carries, 113 yards, 1 TD) taking the ball in from the 1 for the final score of the game, but no mention of the fumble recovery that set that short drive up. The game broadcast itself had nominal A-Game status with CBS Sports' lead college football team assigned to the game. But this interview gaffe, along with what sounded like a less-than 100% Verne Lundquist (voicewise), made the game less that an A-level presentation. Anyhows...congrats to the Navy team for a well deserved victory!